While I was growing up, I only ate canned sardines with a side of toast or crackers – it was something I recall my Brazilian grandfather like to do while drinking beer at home. Later in life when times were lean (as they often tended to be during my 20s) I would make them with scrambled eggs over rice – but only recently did I discover that yes, the humble canned fish easily found next to tuna, pink salmon and anchovies is quite versatile when used creatively. In spite of their reputation of “poor man’s food,” sardines are actually very good for you because they are rich with omega-3 fats (the healthy kind of fat) and calcium. Though a staple in supermarkets around the country, Americans have consumed less and less of them, and recently the last U.S. cannery (in Maine) shut down for good in spite of Chefs’ attempts to reboot their image. I rediscovered sardines through Renata, who does appreciate them. She routinely enjoys them like my grandfather did – served cold with bread and a side salad – once I made them heated with sautéed onions and she was shocked and later surprised with the result. But I still didn’t really cook them with anything until last November when I came across a recipe called “locrio de pica-pica” while searching for traditional Dominican dishes to cook at home (Renata and I have visited The Dominican Republic several times but somehow I never learned much about their food save for mangu, mofongo and the tripe-based mondongo). It is basically sardines in hot sauce cooked with rice and mixed vegetables which I adapted by replacing one can of the hot kind with one can of sardines in tomato sauce, which tasted milder but also way richer. This spiked my curiosity, and I began searching online for other ways I could use them on a more regular basis. I was surprised at my findings – there are countless options out there, ranging from traditional recipes from Western Europe to more contemporary creations served as breakfast, hours oeuvre or as a main meal. 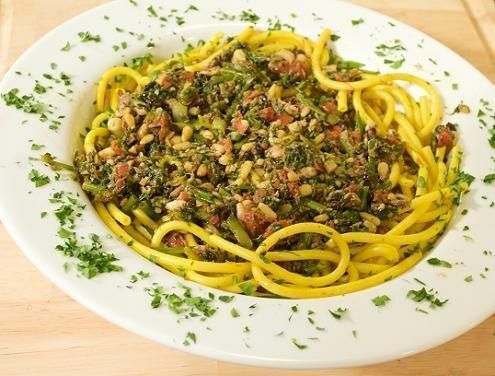 One instant favorite was “Pasta con Sardo,” a simple Sicilian recipe in which the fish is cooked with garlic, olive oil and parsley and served over pasta – quite delicious and really easy to make. 1. Bring a large pot of lightly salted water to a boil. Add the spaghetti, and cook until al dente, or 8 to 10 minutes. Drain, and rinse under cold water. Toss with 1/4 cup olive oil, cover and keep warm.